Constantin Alecse was born on February 21, 1951, in the village of Dambroca, District of Sageata, Romania, from parents: Enache and Anica Alexe. He is married to Elena, n.Tanase, a teacher. Father Constantin Alecse has four children: Cristian-Constantin, Marius-Thomas, Gabriella-Emy and Anne-Claudia and 3 grandchildren. General and Elementary School, in the village of Dambroca, Sageata, 1958-1965. Orthodox Theological Seminary ""Bishop Kesarie " in Buzau (1965-1970). Institute of Theology "Justinian Marina" from Bucharest (1970-1974). He graduated from the "Justinian Marina" Institute of Theology" in Bucharest. Graduated in 1974 with the thesis "The Doctrine of Holy Scripture, Tradition and Church, in Orthodox, Protestant and Catholic Theology" (picture). Between 1974-1976 he attended PhD courses at the Theological Institute in Bucharest, under the guidance of the famous Prof. Dr. Dumitru Staniloae, Professor of Dogmatics (1974-1976). 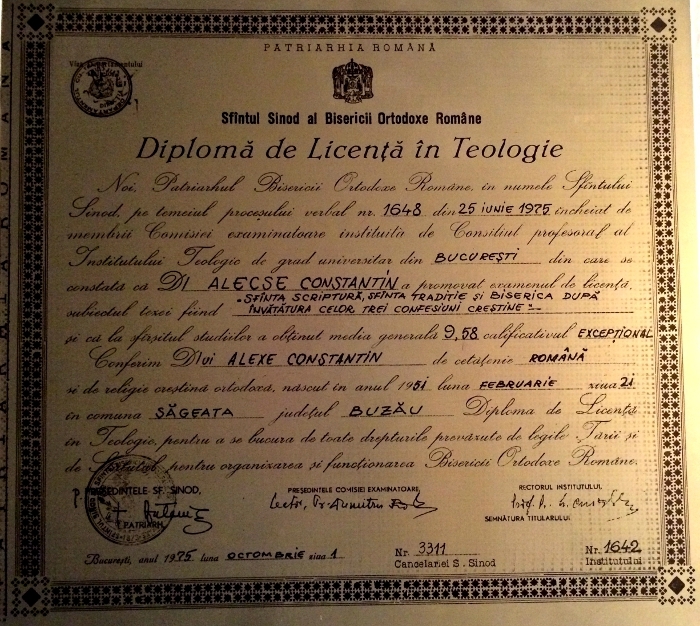 Following the successful passing of the examination to qualify for the program of" scholarships and the employment of priests for Romanian Orthodox parishes abroad", theologian Constantin Alecse was qualified in 1976 for a scholarship from the University of London (England), The Department of Theology, being at the same time appointed as deacon for "St. George" Romanian Orthodox Church in London. Under the guidance of Dean A. W. Allchin, the Dean of the Canterbury Anglican Cathedral, and Rector of the Department of Theology at the University of London, Father Alecse began his doctoral thesis with the subject: The Concept of the Incarnation of the Son of God in the Anglican Theology of the 16th Century until the 20th Century. 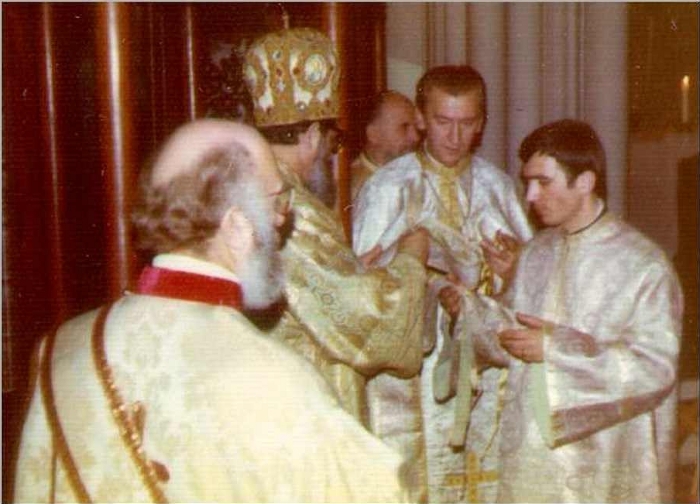 Ordination: Holy Deaconate - On November 29, 1976, was ordained as Deacon by Bishop Lucian Florea Fagarasanu of Paris, France (picture). 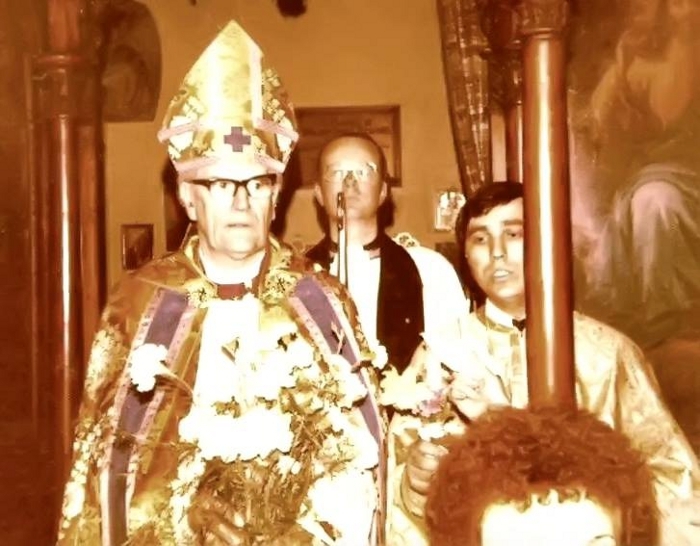 On Christmas Day, December 25, 1976, Deacon Constantin was ordained to the Holy Priesthood by the same Hierarch, Bishop Lucian Florea Fagarasanu for the Romanian Orthodox Parish "Sf. Gheorghe" in London, within the "St. Dunstan's in the West" Church of England, London. During that time he was entrusted with the mission of being "The Official Representative of the Romanian Patriarchate to Dr. Donald Coggan, the Archbishop of Canterbury, receiving at the same time the church distinction/title of "Cross Bearer"/"Iconom Stavrofor". In 1977, Dr. Mervyn Stockwood, Bishop of Southwark/Southern London, named him as an Honorary Chaplain to the Diocese of Southwark/Southern London, in the Church of England. As a representative of the Romanian Patriarchate to the Archbishop of Canterbury, and Honorary Chaplain of the Diocese of Southwark, Father Constantin Alecse participated in many ecumenical services, preaching Orthodoxy in many Anglican Churches and attended conferences, symposia and ecumenical gatherings in England. Between 1976 and 1980, as editor-in-chief and chairman of the publication's committee of the Romanian Orthodox Church of "St. George" in London, Father Alecse printed the annual Almanac "Altarul/The Altar" and the quarterly magazine "Altarul/The Altar", to which he contributed dozens of articles. Between 1977 and 1980, besides quarterly and annual religious publications, "The Altar/Altarul," Father Constantine Alecse edited the publication "Life in Christ" magazine of the Mission for the cities of Birmingham, Leicester and Notthingam , as well as the periodicals: "Historical Landmark" Poetry - The Nation Fatherlands' Ode","Romanian Christmas Carols Collection","From History of our Forefathers","Dedication to the Great Union 1859-1918"(1979),"Dacia under Burebista 70-44 BC"(1980) etc..., published in the "Romanian Horizons" Collection Press. 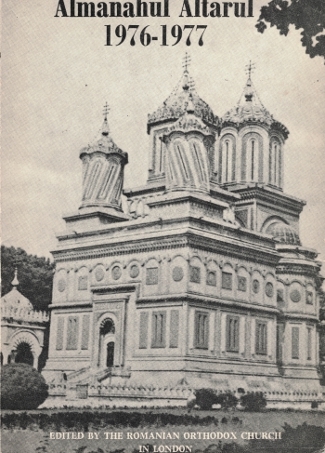 During the period of 1977-1980, Fr Alecse initiated the establishment of the Romanian Orthodox Missions in Birmingham, Leicester and Notthingam, traveling extensively to many cities, and serving the spiritual needs of the Romanian Orthodox believers in these cities in England's Middle Provices. Also during this period of time, as a Representative of the Romanian Patriarchate to the Archbishop of Canterbury, and Honorary Chaplain of His Eminence Bishop +Mervyn of Southwark, Father Alecse participated in countless ecumenical religious services, preached Orthodoxy in many Anglican Churches, and attended many conferences, symposiums and ecumenical meetings in England (photo). Appointment Decree for The Office of Honorary Chaplain of Dr. Mervyn Stockwood, MP (Member of the British Parliament), Bishop of Southwark - 15 November 1977. Diocese of Southwark. Minister Constantin Alecse. Honorary Chaplain Appointment ... Be It Known that We +Mervyn, by Divine Will, Bishop of Southwark (South London), we offer here (only during our pleasure) the Minister CONSTANTIN ALECSE to be one of our honorary chaplains, with all privileges and immunities, pertinent to this function. That is why we have signed this appointment, signed by our hand and by applying the episcopal seal on this document. DATED today, the fifteenth day of November, in the grace year of the Lord, one thousand nine hundred and seventy-seven, and the eighteenth year of our consecration. SS / + Mervyn Southwark & SS / Seal. At the beginning of 1980, Fr Alecse emigrated to the United States, being accepted by Archbishop Valerian under the jurisdiction of the Romanian Orthodox Episcopate of America at Vatra Romaneasca. From March 1980 to September 1982, he served as parish priest of St. Mary Roman Orthodox Church in St. Louis. Paul, Minnesota. Between 1981 and 1982, he attended computer courses at the "National College of Business" a South Dakota Branch of St. Paul Minnesota, accumulating a total of 38 credits, specializing in computer programming in various computer languages, communications, accounting, domestic and international businesses - USA and International business - finances. In September 1982, he was transferred to the Holy Trinity Romanian Orthodox Church in Los Angeles, California, as parish priest, position which he holds until today. In Los Angeles, besides his church activities, Father Alecse has also specialized in the real estate business, holding a license in Real Estate between 1986-1991, becoming a co-owner of the real estate sales, buying and investing Department of Real Estate Offices of "David Loren and Associates" - of San Fernando Valley,, California. In September 1982, he was transferred to the Holy Trinity Romanian Orthodox Church in Los Angeles, California, and for some 37 years he is the Senior Pastor of that church, until present. In the ecclesiastical realm, in April 1984, Father Constantine Alecse was appointed to the rank of Dean of the Pacific Coast Deanery, within the Romanian Orthodox Episcopate of America, by Bishop Nathaniel (Popp). As a Sr. Pastor, and Dean of Missions ROEA, Father Constantine Alecse was the founder of many missions and parishes within the Pacific Coast States. On the retirement from this position, in 2014, the ROEA's "PCP" has 18 parishes, missions and one monastery. Between 1985-1986, along with Father Cornel Avramescu of Orange County, he coordinated an hour of radio religious broadcasting, every Sunday afternoon through the Good-News radio station in Mount Wilson, Southern California. In May 7-22, 1994, alongside with other 5 priests of the Vatra Episcopate, Father Constantine Alecse was part of the delegation of His Eminence Archbishop Nathaniel, who made an official visit to Romania, at the invitation of His Beatitude Patriarch Teoctist. A detailed report of the visit was published in the Solia Calendar 1995, pp. 155-196, with dozens of illustrations. Some of them can be seen in our Church Archives. The Protopresbyter Constantine Alecse is the author of books, magazines and theology articles published in the church magazines of the Romanian Patriarchate; the "Solia" calendars and journals/magazines of the Episcopate, in the United States of America; some Romanian newspapers in North America; (1976-2010) and the "Altar Almanac"- the annual calendar and the quarterly magazines, with the same name, of St. George's Romanian Orthodox Church in London (England). 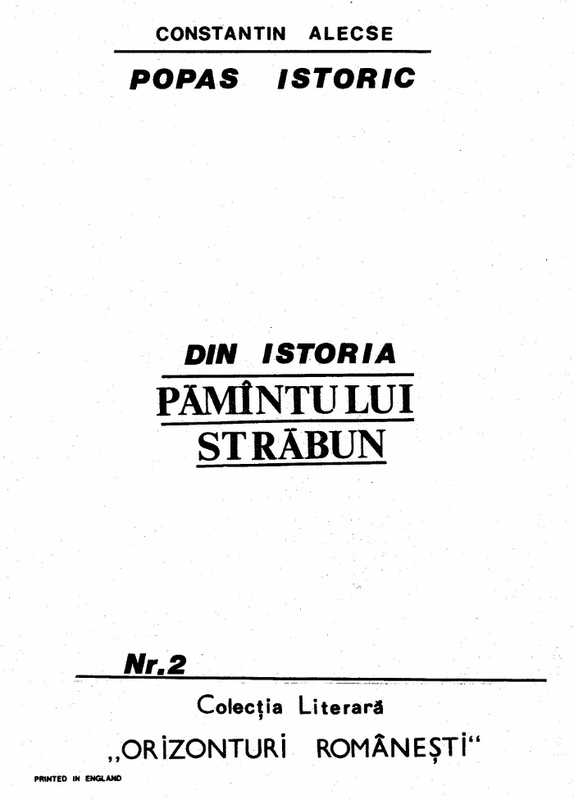 AMONG ANGLES AND DEMONS - PRINTRE ÎNGERI ȘI DEMONI (An autobiographical book - Vol.I), includes Fr Alecse's childhood times, his schooling and training for the Lord's ministry, the hardship he and his family endured during the communist-atheistic regime, the forced collectivization, his years of Seminary and Faculty training, the blessing of establishing a family, his ministry in England, and also the many successes, accomplishments and blessings he had encountered during those years (1951-1980). THE MISIONARY - MISIONARUL (An autobiographical book - Vol.II) comprises his priestly service on the American Continent. The book portrays all his love and tallents that God gave to him to become a servent of his fellowmen, by serving God. By his service, in the Lord's Vineyard, the number of Faithful increased, the ecclesiastical patrimony of the church was also enriched, always having as a priority helping people in time of their needs and sufferings, in their times of trouble. WTHIN PASTORAL LIFE HEART - CULISELE VIEȚII PASTORALE (An autobiographical book - Vol.III) refers to the relationship Fr Alecse had with many religious and secular personalities, as well as to the many funny moments and events that happened to him throughout his ministry. The book also includes social, political, educational, immortal parables, which he likes to call them the "Salt and pepper", which quite offten he uses in his Sermons, a true desk from which the faith is preached. CHRISTIAN WORDS OF WISDOM - CUGETĂRI CREȘTINE - A book in which, in collaboration with ing. Mircea Iordache, the autor compailed a collection of outstanding axioms, biblical quotations and histories from Father Confessors, phylosophers and other inspired universal personalities. This book could be considered a balm for Christian souls, and due to the fact that in the last chapter the book offers, on behalf of the whole Romanian Nation, the gratitude to the Holy Romanian Saints and Confessors who were emprisoned, suffered and many of them died in jails, by the communist bolshevic oppresors (1948-1989). 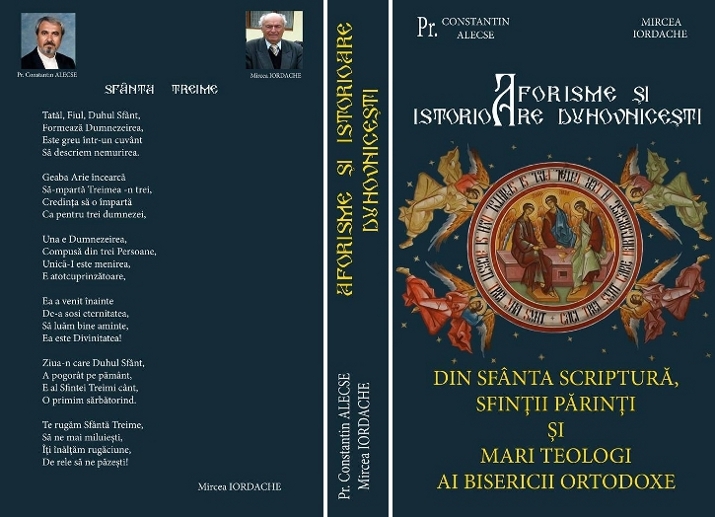 HISTORICAL ECCLESIOLOGICAL APHORISMS AND QUOTATIONS - AFORISME ȘI ISTORIOARE ECCLESIOLOGICE Starting with a comprehensive presentation of the history of the Romanian Orthodox Church from its origins to the present, the book offers a synopsis of the themes of the Holy Scripture, and a collection of axioms from the Holy Fathers and Great Theologians of the Orthodox Church. The work is done in collaboration with ing. Mircea Iordache, 2017. DAMBROCA, RAINBOW OVER TIME, THE VILLAGE MONOGRAPHY / DÂMBROCA - CURCUBEU PESTE TIMP - REPERE MONOGRAFICE, "A collaboration of materials, published by ing. Mircea Iordache, and Dean Constantin Alecse, of extremely complex and interesting historical, geographical and spiritual landmarks of Dambroca, a tribute to the purity, suffering, patience and honesty of the Romanian rural world. A thorough study case the autors have done regarding their native village...." (Univ. Professor Dr. Gh. Calcan). SAGEATA, A VIRTUAL FLIGHT IN TIME, A MONOGRAPHIC PAGES / SĂGEATA, ZBOR PRINTRE VREMURI, PAGINI MONOGRAFICE, work in progress. Coordination: Ing. Mircea Iordache, and an editorial board, composed of over 15 experts from the locality, and protopop Constantin Alecse, the developer of the virtual version, and a member of the editorial board. Quarterly Parish Magazine "Altarul/The Altar"
"Life in Christ / Viața în Hristos" A semi-annual magazine of the Orthodox Mission in the cities of Birmingham, Leicester and Notthingam. The Periodicals: "Historical Landmark" Poetry - The Nation Fatherlands' Ode,"Romanian Christmas Carols Collection","From History of our Forefathers","Dedication to the Great Union 1859-1918"(1979),"Dacia under Burebista 70-44 BC"(1980) etc..., published in the "Romanian Horizons" Collection. 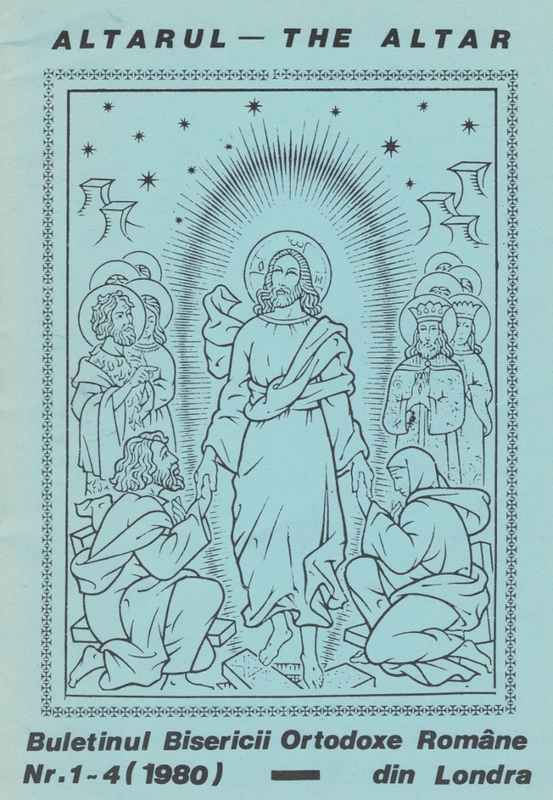 The "Christian Life/Viata Crestina" magazine, from 1989 to the present, which originally appeared as a bimonthly supplement to the parish newsletter of the "Holy Trinity" Orthodox Roman Church in Los Angeles, developing over the years as a journal of Orthodox Spirituality, local informations and international churches updates. 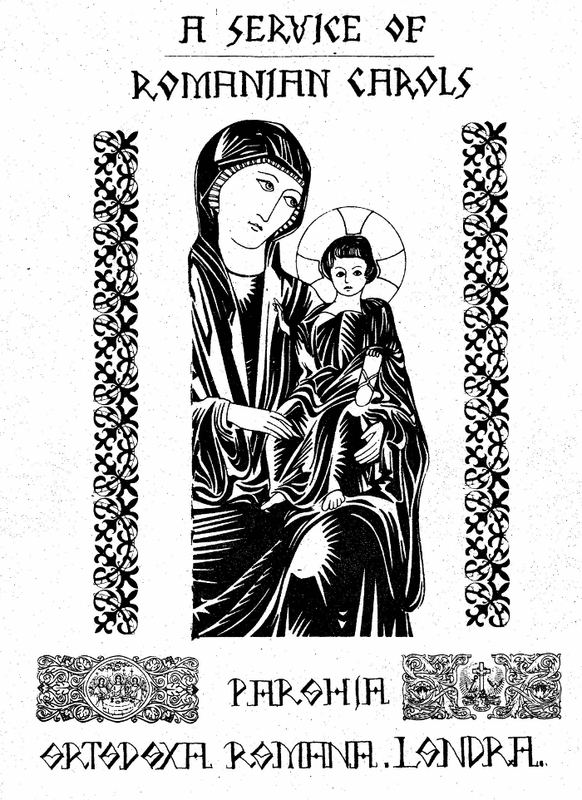 A compendium of articles and materials published over the years (to the year 2000) by Father Dean Constantine Alecse, is in the "Virtual Archive/Arhiva Virtuala", a supplement of the "Christian Life" magazine. Newspaper "The Universe" - weekly editorial, published of the renown Romanian journalist Aristide Buhoiu, to which I have contributed, for 3 years (1986-1989), with a "Tablet of Faith". Prof. Domnita Dumitrescu - Fenomenos paralel de contacto con el entles en espanol y el rumano hablados en Estados Unidos. Atti del XXI Congreso Intemazionale di Linguistica e Filologia Romanza, Centro di studi di filologi e lingvistica siciliani, Universita di Palermo, 18-20 sept., 1995, a cura di Giovanni Ruffino, vol. V - Dialettologia, geolinguistica, socialinguistica, Max Niemeyer Vertag , Tubingen, 1998, pp. 275-283. Romania, from New York to Los Angeles, authors: Emanuel Tanjala and Dan Cristian Turturicã, Nemira / Tãrmuri Publishing House, 1997, pp. 314-318, ref. "Father Alecse, Parish Priest at the Great Hall of the Romanian Orthodox Church in California". Acatistier.org - Acatistos Service Book - 31 Acatistos and 2 Paraclisis, at the greatest Feasts and Royal Feastdays during the church year. 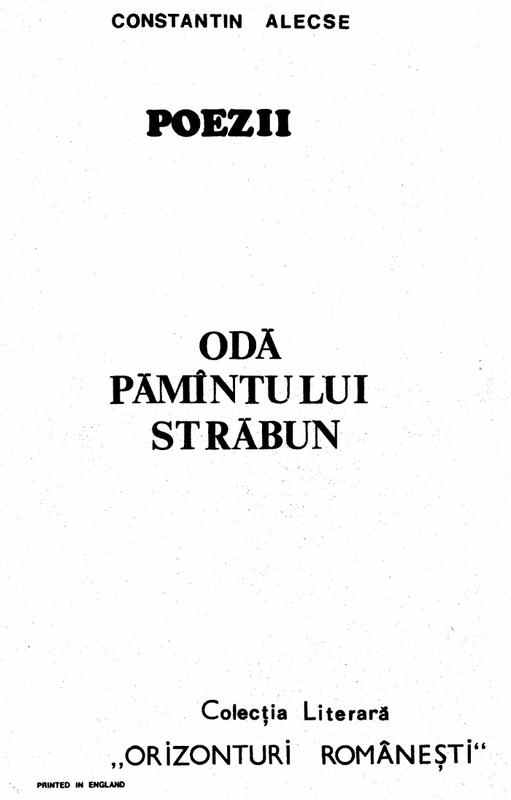 Liturghier.org - Holy Liturgy (text) - In Romanian. Holy Liturgy of St. John Chrysostom, Preparatory Prayers, Proscomedeia Prayers, Priest's Vesting, Invocation Prayers, etc. OrthodoxCatechism.org - Orthodox Catechism in English. OrthodoxPrayers.org - Orthodox Prayer Book, in English. Psaltirea.org - Psalter - The 150 Psalms of Emperor David. Publicatii.com - "The Christian Life" - Quarterly, bi-lingual Theological Review of the "Holy Trinity" Romanian Orthodox Church in Los Angeles, California. The Christian Life Magazine. RomanianBible.org - The Bible, in Romanian - with a "search engines", The Holy Synod edition of 1998, the Old Testament - with Apocrypha - and the New Testament, each chapter with a separate page, easily indexed. Project done with the blessing of His Eminence Archbishop Nathaniel. Rugaciuni.org - Book of Prayers, in Romanian. SfantaTreime.org - The official website of the Holy Trinity Church in Los Angeles, California. News from, and about the parish, administration, religious, social and cultural activities, spiritual articles, links to other pages, similar content, church and civic institutions in Romania and USA, etc. TeologiRomani.com - Dictionary of Romanians Theologians - Web-page containing the work of the Prof. Univ. Dr. Mircea Pacuraru, containing over 720 personalities, "from the time of the Dacians to the present" - as the author of the book states in his introduction. ViataCrestina.com - The virtual library - The holy services, with the design of thousands of images, The "Christian Life", bi-lingual, Romanian Carols, Bible, Acatistos, Prayers in Romanian and English, publications, Spirituality, Catechism, Church History, Apologetic Christianity, Sermons, Homilies, Various Links, etc. Forumul Dâmbrocean - Fr Alecse is the administrator of this Forum, in Romanian, and in English, where topics of Romanian interest and Orthodox spirituality are addressed. FaceBook - The Official Website of the Holy Trinity Church, administered by Fr. Alecse. Fr. Constantine Alecse, during his pastoral work in Los Angeles(1982 until today), played the role of "priest," in several films or documentaries, with Romanian themes, or helped in various forms of producing such films, including Orthodox spirituality. Songs of the Carousel - "Thy Will Be Done", a Living Waters Production, a documentary about the life, virtues and martyrdom of the Romanian Emperor Constantin Brancoveanu's family, in defense of the Ancestral Christian Belief (1999). "AXIOS" Carols' visit, in California, 1999-2000, a group of 34 professional singers. Second Coming of Christ - The journey of a woman scientist who, at the end of times, discovers that true Faith can bring Miracles. Most of the Movie Scenes were filmed at the Holy Trinity Romanian Orthodox Church (2016). Armenia, My Country, My Mother, My Love - The destiny of an Armenian family, living in the Ottoman Empire, in 1915, whose dreams will become memories in the eyes of the most famous Armenian American artist, who lives to paint the story of his shattered childhood (2016). Immigrant Priest - The life of a Romanian Orthodox Priest, that went from a hard childhood in communist godless Romania, to the land of all freedoms, America (2016). TV Romania-West - In the period 1998-2003, along with other leaders of the Southern California community, initiated the Romanian television Sunday, in Romanian, Western Romanian Television. Participation in countless colloquia and television shows and programs or radio talks with local civic personalities from the secular and religious world, Christians or non-Christians, on subjects of civic and/or religious interest. Dean of the Pacific Coast Cooperative of R.O.E.A. (1984-2014). Who's Who - Romanii din America - The Romans in America (Diaspora Encyclopedia - 500 US and Canadian personalities - Montreal, Canada, Luceafarul Romanesc Publishing, Prof. Dan Fornade, 2000. Metropolitan Who's Who, New York, (2007-2008), a publication, and a bibliographic dictionary containing a list of personalities categorized by various fields. 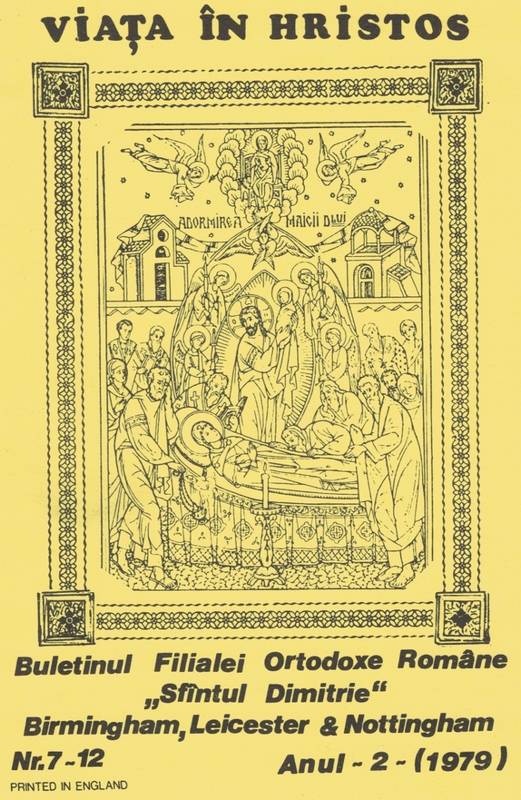 The Annual Calendar of SOLIA (1981-present), published by the Romanian Orthodox Episcopate of America and Canada, under the guidance of the Hierarchs of Worth IPS Sa - Archbishop Valerian Trifa (1981-1984), and IPS Sa - Archbishop Nathaniel Popp (1985-present) Quarterly SOLIA Magazine.